Clay Aiken – More Joseph Fun! Here is some more “Clack” from Ogunquit, Maine. 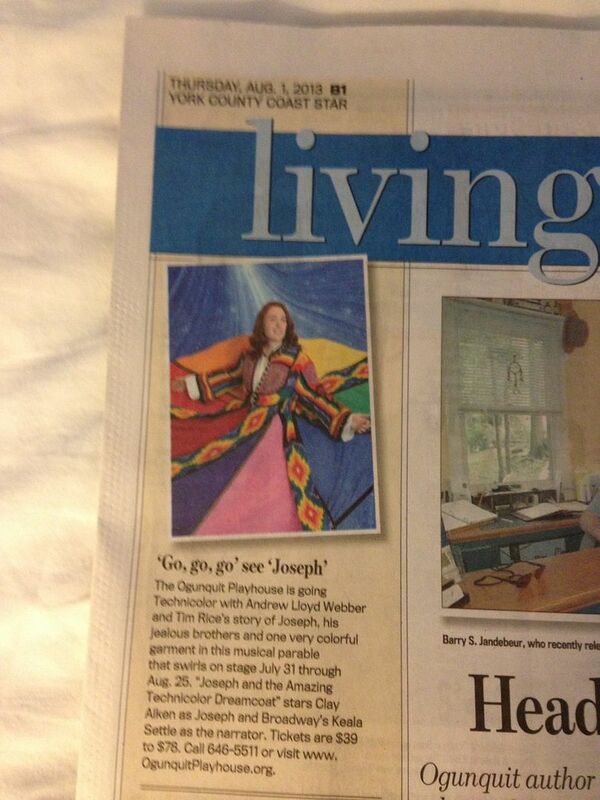 It is fun to see Clay and read about his successful role in Joseph and The Amazing Technicolor Dreamcoat. Huge Thanks to all who are sharing the comments, pictures and videos! Cathy Goodwin It was FABULOUS!! Clay Aiken was terrific and the supporting actors were terrific! What a fun show! It’s a must see! Oh and did I mention the amazing sets and costumes?? Joseph at the Ogunquit Playhouse… one of the best shows I’ve seen in a long time. The brothers were outstanding. If you’re out this way before the run ends, don’t miss it! Clay was fabulous as all the cast members. They all work together in unison. That’s why the show is so cohesive. The sound was much better, I found. This time I brought my binoculars. I could see closeup Clay. I saw that when Joseph became no. 2 to the Pharoah, he has lines drawn on the sides of his eyes. It’s a line out of the corner of the eye and a horizontal V at the end of the line. He looks spectaclar in his gold armour riging in his gold chariot at the end, Everyone was so astonished when Joseph gets thrown into the pit by his brothers. Clay just slides right into the hole!! BIG standing O and tons of cheers for all cast members but the loudest cheers rang out for Clay!! Merchandise -There is only the poster for $6 with Clay in his technicolour dreamcoat. The rest are just the usual JATATD merchandise – mug for $15, T shirt for $ 20? I forget. We managed to get to the front at the stage door. Clay came out after the men cast members left. Took about 15 minutes. My sister got a poster signed and I have stage door video but have no way to upload yet. Will do so after I get home. He looked goid and joked with us that we have nothing to say. He signed everyone’s items quickly and was gone in a flash after thanking everyone for coming. Gerry Barry Saw Joseph last night. Great show, entire cast was awesome. Keala sang wonderfully and Clay was fantastic. Delightful night at the theater. I can't believe how much info I am getting here. Thank you so much for all that you are sharing with us. It is so nice to go to one place I know I will get everything about Clay and Joseph. I am sure it takes a good amount of time to do this so thanks! Musicman123 your are fantastic!!! We so look forward to this. I'm going to see Joseph on 8/22. Can't wait. I grew up two towns away. Happy to go back after ten years!!!! Wow! Those videos were great, especially the matinee one because you could see Clay more clearly in the day. Thanks so much again Musicfan xox. Thanks for sharing the vids!!!!! He seems like such a sweetheart!!!!! I LOL'd when the one fan told him about auditioning for Idol!!!!! Thanks again, Musicfan!!! XOXO!!! Error: Error validating access token: Session has expired on Tuesday, 21-Aug-18 16:13:01 PDT. The current time is Thursday, 18-Apr-19 12:59:36 PDT.